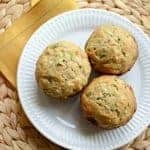 Pineapple Zucchini Muffins are perfectly sweet and extra moist and fluffy thanks to the addition of crushed pineapple and grated zucchini. We are leaving for Idaho this weekend for a wedding and to visit my sister and friends. Then at the end of the month we are taking the kids to Yosemite, Sequoia, and San Francisco. I LOVE to travel, and I’ve been looking forward to these trips for a long time. When you start to dabble in a hobby farm, leaving on vacation, even a short one, takes on a whole new level of planning. Will the chickens, ducks, and bunny need anything? Who can check on them? And then there is the garden which is now massive and producing so much food. 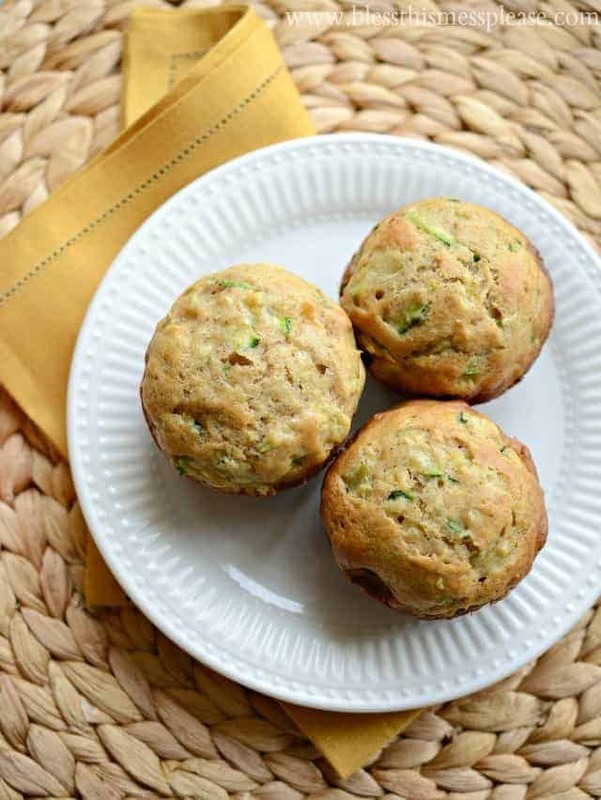 I know when we get back we are going to have some zucchini the size of the Ark, so I’m planning on making these zucchini pineapple muffins again soon. I love using small zucchini that are 6 to 8 inches long for things like my favorite garden veggie side dish and for fresh corn and zucchini succotash. You don’t have to peel them or take out the seeds; they are perfect for things like these dishes. But every now and again that zucchini gets a little crazy and before you know it, it’s gigantic and boat-like. Those monster squash are the perfect kind to use in a recipe like this. Just peel the outside, remove the seeds, and grate away. These muffins are awesome! The pineapple adds a lot of moisture and sweetness and they have just the right amount of spice. They make an easy snack or a delicious side to scrambled eggs at breakfast. 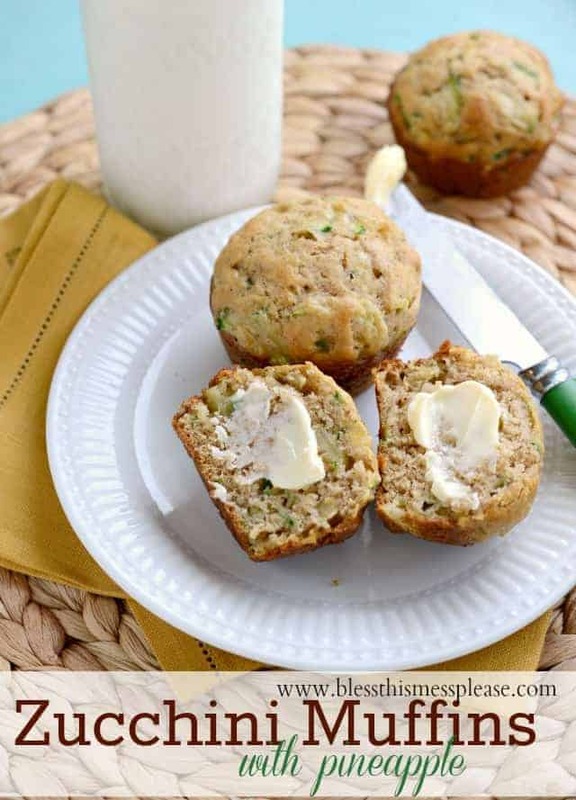 I use whole wheat flour when I make these all of the time, so feel free to switch out that white flour if you like because it works great with this recipe. If the pineapple is not drained well or the zucchini is left with all of its water, then the muffins will come out gummy. To get the extra moisture out of the zucchini, place the shredded zucchini on top of two stacked paper towels and then press on it with two more stacked paper towels. Get that moisture out! You can sub the white flour for whole wheat (I did and loved it and it is still just as moist). Just bump the baking powder up to 1/2 teaspoon if using whole wheat flour. No need to use cupcake liners for your muffins; just grease or spray your muffin tin well. In a medium mixing bowl, add the sugar, applesauce, oil, eggs, and vanilla. Stir to combine. Sprinkle the flour across the top of the wet ingredients and then sprinkle the baking soda, cinnamon, salt, and baking powder across the top of the flour. Stir everything together just until combined. Add the zucchini and pineapple and stir to incorporate. Pour the batter evenly into 24 muffin cups and bake until the center is set and a toothpick inserted comes out clean, around 20-22 minutes. 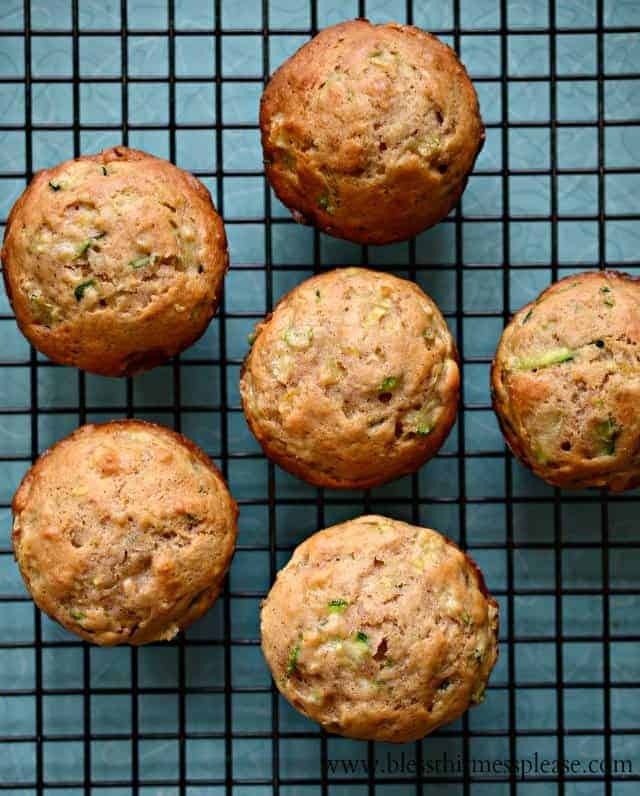 If the pineapple is not drained well or the zucchini is left with all of its water, then the muffins will come out gummy. To get the extra moisture out of the zucchini, place the shredded zucchini on top of two stacked paper towels and then press on it with two more stacked paper towels. Zucchini is one of my all-time favorite veggies. There’s just so much you can do with it. Have a great day and enjoy the last days of summer and all its vegetable bounty. These look good! I can’t wait to try them. One trick to draining zucchini that works really well: put grated zucchini in a clean dish towel and squeeze it out over the sink. You can usually get a lot more water out of it, and the towel won’t tear (like its paper counterpart). It is amazing how much water zucchini holds! Love your blog and your recipes and pictures are great! Is this muffin very sweet due to the 2 cups of sugar? if I reduce to just 1 cup will it be ok? No idea friend… I’m sure there’s some kind of calculator online but I just haven’t used them. Good luck! I only have larger cans of crushed pineapple. Do you have an idea of how much it should measure or weigh after you drain the juice? I do that pretty often and just end up using half of the strained pineapple and saving the second half for another batch. It always works out great. Enjoy! I have never cooked with zucchini before and I have a question please. When baking with zucchini, should you peel it or no? Your pictures look like you did not peel, but I just want to make sure. I plan to make this recipe soon, it looks so tasty. Thanks so much. It just depends on how big it is. If it’s small, say 8 or 10 inches long and maybe 3 inches thick then I wouldn’t peel it. If it’s much larger than that I would though! It’s kind of up to you! Good luck friend and let me know what you decide. I should have gone with my gut on this one (the gut reaction being, this sounds tasty….and will be WAY too dry). I made these exactly as listed, except I used 1 cup of sugar (we don’t like super sweet muffins, and I don’t like all the added sugar), and used white whole wheat flour, doubling the baking powder as suggested. I used melted coconut oil too. These were doughy and clumpy though, and certainly weren’t “pourable”. I had to add 1/2 cup milk to even get them slightly workable (they still didn’t pour). Having said that, they were still pretty tasty and my husband gave them a thumbs up, so I will be making these again. Next time I will try to add even more milk though. They certainly weren’t as moist and fluffy as yours. Is the ingredient list missing a sort of milk, or did I do something wrong!? I did forget to add the sugar in first since it is a dry ingredient, but I wouldn’t think that would change much. I followed this recipe exactly. Drained the pineapple, squeezed the liquid out of the zucchini. Although the flavor was ok, they were very heavy and a little gummy. I probably won’t try them again. Can’t wait to try this out. Love to make muffins for our family DIY project. Haven’t tried pineapple before.